Welcome to London, Prince George! Now, if that’s not a brilliant reason to name your son George, I don’t know what is. One of my very first crushes, right there. I mean, look at the fellow! A fine upstanding member of the Royal Family, a young man with magnificent calves, an unparalleled collection of socks, and a butler with more metaphors at his ever-clenching fingertips than Matty McMetaphor the All-Mercia Metaphor Mangler. And a Trinity Tiddler to boot. Ahoy there, George! And if, like me, you sometimes find it hard to tell all those Hanoverian Georges apart, I can heartily recommend the Four Georges song from Horrible Histories. Once heard, never forgotten. Literally. You will never, ever stop singing it. Anyway, this week’s #hestercocktailhour was in honour of the new George (sort of) and was the very delicious Stork Club cocktail. It wasn’t, of course, named after the giant ceremonial stork that the Queen sends to collect the royal heir from the Clarence House gooseberry bush, but after the Prohibition Era nightclub in New York. Apparently the orange juice was used to cover up the rough nature of the bathtub gin – you might want to add more or less juice depending on how rough your own hooch is. 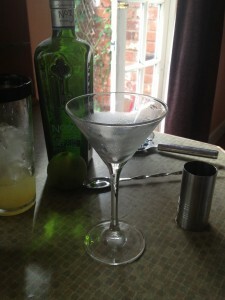 Put the ice into a cocktail shaker (do bother with the shaker this week, this is a royal baby we’re toasting here, chop chop), add the gin, orange, Cointreau, bitters and lime, and give it a good shake to chill down the drink. 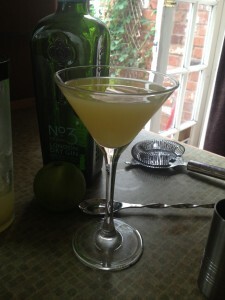 Strain into a martini glass – and if you can chill that first too, it’s even more refreshing. Toast – in Welsh would be nice, iechyd da – and sip. Mmm. Rather lovely, this one. Actually, is there any left in that cocktail shaker?